1: chassis matches with the Cummins engine. 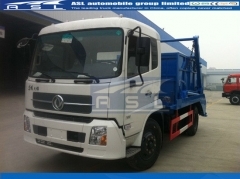 The structure introduction refers to the chassis specification. 2: Special function assembly: The special function assembly includes subsidiary frame assembly, support assembly, hopper assembly, crane arms assembly, legs assembly and lifting chain assembly. 3: Subsidiary frame assembly includes the cross & frame rails and plate. It is a basic frame for the support assembly, hopper assembly and crane arms assembly. The special function assembly is connected with chassis via bolt shaped” U”. 4: Support assembly connects with the subsidiary frame, and provides space with the hydraulic system assembly. 5: Hopper assembly is used to load household garbage, cinder, slag and so on. There is a flip shaft under the rear of the hopper. On the transportation situation, the hook hitches the flip shaft. According to the hook’s on/off the goods will dump or leave 3Tons Heavy Duty Skip Loaders when charge/discharge. 5: The lower extreme of the crane arms connect with the support via shaft, and the higher extreme are tightened by steel tube. Above the arms, there are supports for lifting chain, which connect with the hopper via lifting chain. The arms’ move is driven via oil cylinder. 6: Legs assembly: the legs are fixed on the support assembly via oil cylinder with flange. Through oil cylinder’s drive, the legs will leave or touch the ground. 7: lifting chain assembly includes anchor chain B13-37（GB549-77）, turnbuckle, adjustment nut, chain ring and so on. The anchor chain diameter is 14mm, inside length is 50mm and endurable max pull is 25 tons. 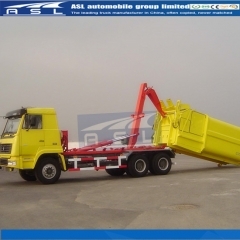 1: Garbage-transferring course: The Truck transfers garbage via its hopper. 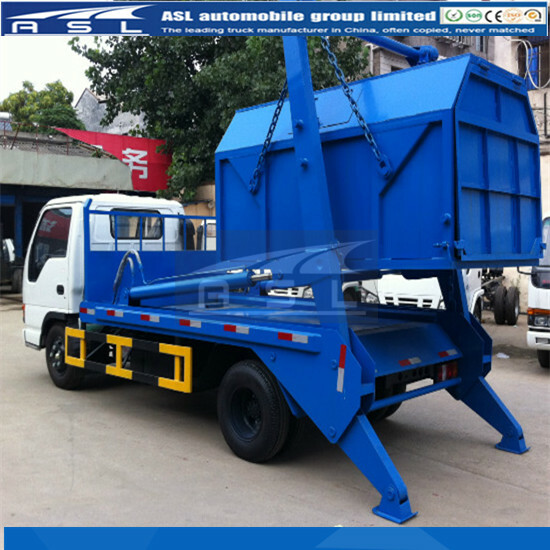 The work course contains suspending the hopper down, discharge the hopper, transportation and dumping the garbage. The hydraulic control comes true by the multi-valve’s handles at the front of the frame. 2: Suspending the hopper down: to move the hopper to the busywork ground from the truck’s body. 1: Start the engine, pedal the clutch and push the power take off machine ahead. When the gear meets to the joggle, release the clutch’s pedal and turn on the power, and then the oil pump begins to work. 2: Push the handle 2 inby until the hook is off. 3: Push the handle 3 and 4 inby until the left & right legs touch the ground to make sure the vehicle’s balance. Attention: the rear wheel mustn’t be away from the ground. 4: when the chain ring connects with the hopper’s lifting ear, push the handle 1 inby to make the arm move backwards. 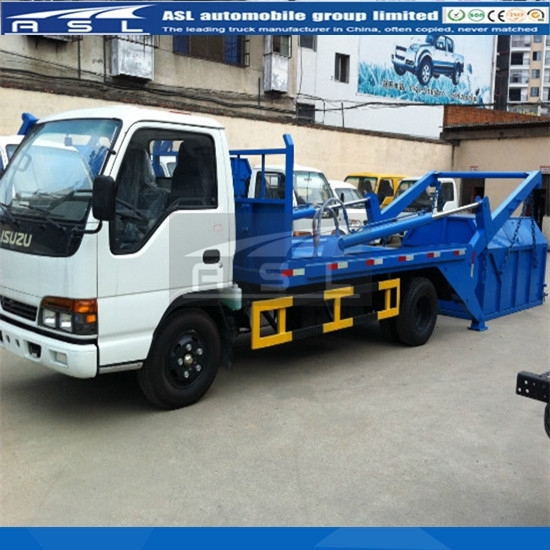 Then, suspend the hopper down depending on the lifting chain on ISUZU 3Tons Heavy Duty Loaders. 5: After the hopper falls to the ground, separate the chain ring from the lifting ear and connects it with the arm’s lifting ear, and then pull the handle 1 outward until the arm returns the original position. Then place the handle 1 in the middle position. 6: Pull the handle 2 outward until the hook is on. Then place the handle 2 in the middle position. 7: Pull the handle 3 and 4 outward to ascend the left & right legs. You can judge whether the legs are in the peak position according to the accelerograph sound’s change. 8: Make the power take off’s shaft in the non-working position to stop the oil pump working. 10: Start the engine, pedal the clutch and push the power take off machine ahead. 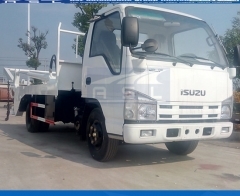 When the gear meets to the joggle, release the clutch’s pedal and turn on the power, and then the oil pump on ISUZU 6wheels Skip Loaders Suppliers begins to work. 11: Push the handle 2 inby until the hook is off. 12: Push the handle 1 inby to make the arm move backwards. Then ascend the hopper. If the rising hopper blocks the arm, the left & right legs should be adjusted slowly to the correct position until the hopper falls to the frame smoothly. After that, make the handle 1 in the middle position. 13: Pull the handle 2 outward until the hook is on. Then place the handle 2 in the middle position. 14: Pull the handle 3 and 4 outward to ascend the left & right legs. You can judge whether the legs are in the peak position according to the accelerograph sound’s change. 15: Make the power take off’s shaft in the non-working position to stop the oil pump working. 16: Transportation: when transportation, the oil pump should stop working. The oil cylinder to control legs dumping hook should withdraw, the flip hook is on and the chain ring connects with the hopper’s lifting ear. If Heavy Lifting Skip Loaders Companies runs without the hopper, the chain ring should connect with the arm’s lifting ear. 2: make sure the hook is on and the chain ring connects with the hopper’s lifting ear. 4: Push the handle 1 inby to make the arm slew rear and the hopper tips rear circling the flip shaft. Then the garbage in the hopper will be dumped because of gravity. 5: Pull the handle 1 outward to make the arm slew ahead and the hopper tips ahead circling the flip shaft, and then it falls smoothly to the frame. 6: Pull the handle 3 and 4 outward to ascend the left & right legs. You can judge whether the legs are in the peak position according to the accelerograph sound’s change. 7: Make the power take off’s shaft in the non-working position to stop the oil pump working. 8: Lifting chain adjustment: the structure of the lifting chain and chain ring. 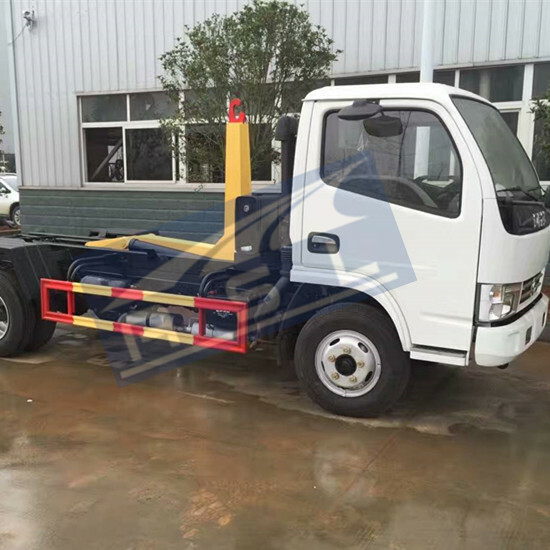 8: The different size of the hopper on China ISUZU 6wheels Skip Loaders should match with different length of the lifting chain. So the lifting chain’s length should be adjusted according to the hopper’s size during the use. The adjustment principle is that the hopper wouldn’t interfere with the arm when ascending the hopper from the flat ground and make sure the hook is on after the hopper falls to the frame. 9: The lifting chain’s length can adjust via the bolt 2 in the picture 2. Screw the nut off, and rotate the bolt 1. After that, the nut should be screwed tightly. To make sure there is enough screw length in turnbuckle 3, L2 shouldn’t be long over 50mm. Through adjust all bolts of 4 anchor chains to change the lifting chain length. 2: Hydraulic pump is gear pump (Model: CBN-F/63), its rating pressure is 16MPa, the max pressure is 20MPa, and displacement is 50ml/r. 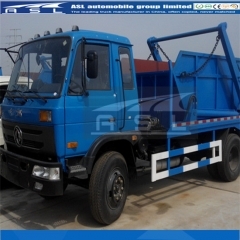 the structure introduction refers to the pump specification. 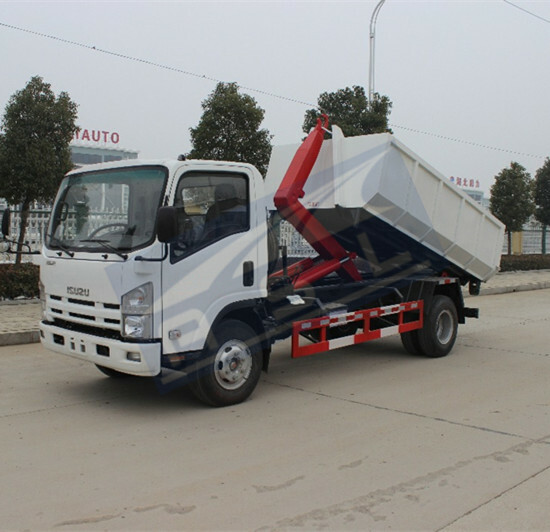 3: The multi-valve (Model: ZS1-L20E-T-40) is made up of 4 manual valves, flooding valve and unilateral valve on Brand New 5Tons ISUZU Skip Loders. 4: Oil cylinder: there are five oil cylinders. 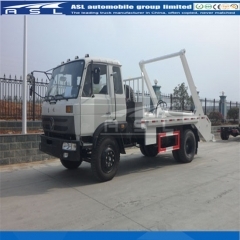 Two of them are used for crane arms to charge/discharge goods (Model: HSG140/70-2301*1600), which are in the arms and can elongate 1600mm; two of them are used for legs to ascend and descend (Model: HG560-100/70-450), which are in the legs and can elongate 450mm; the last one is used for flip hook (Model: HG561-40/20-345*135), which can elongate 135mm. 5: Unilateral balance valve: to avoid the hopper falling too fast and make sure it falls smoothly. Its model is BQ223. 6: Bidirectional hydraulic lock: to avoid the oil leak caused by the multi-valve’s damage. They are fit on the legs’ oil cylinder, which Model is SO-B81-S.
7: Oil box assembly: is fixed at the front of the frame. There is clapboard in it, which to disport it to oil in area and oil out area. There are net filters under the in& out tubes. The capacity of the oil box is 85 liters. You can observe the oil pressure change through the pressure gauge on ISUZU 6wheels 5CBM Skip Loader Trucks. 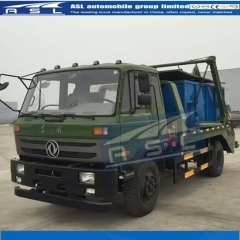 1: Concerning the Garbage Collector Truck (Model: SAL5140ZBBE)’s break-in period and engine & chassis’s maintenance please carry out according to the Dongfeng dumping truck manual. In the new truck’s break-in period, its loading weight shouldn’t be over the 2.5 tons. After the driving distance gets to 1000km, it can work fully loaded. 2: The oil level in the oil box should have a check every month, the oil filter should have a washing every 3 months. If the oil level is lower than the oil scale, the hydraulic oil must be added in time. If the oil has turned, you should change the oil immediately. 3: The bolts and connectors should be often checked. Once they are not hard up, you should screw them tightly. 4: Often check whether leaks oil in hydraulic system, maintains in time and change oil envelop. 5: High pressure tubes must be changed every two years and check at any moment. If the tubes chap, damage or expand partly, they must be maintained even changed timely. 6: If the lifting chain is found damaged, it must be maintained even changed timely. 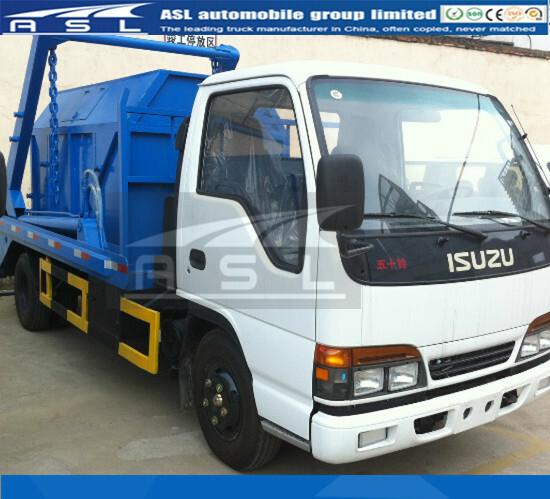 7: lubricate every 3 months as the following form on 3T ISUZU 6wheels Skip Loaders. The lubrication type is SYB1401 62. 1: Any person is not allowed to stand under the crane arms. 2: Please not lift goods only with cross rail or single crane arm. 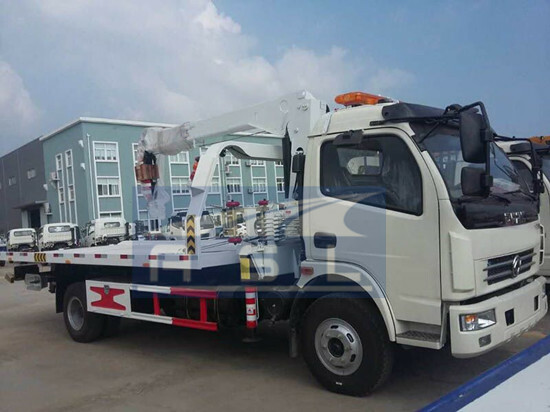 3: During disassemble the oil cylinder of the crane arms and refit it to the vehicle, the operator or stander-by must be far away the arms working area to avoid accident. 4: When the vehicle drives without the hopper, the lifting chain must be hung on the lifting ear. 5: The legs should only touch with the ground. Except changing tires, the rear wheel never be far away the ground. 6: After make sure hook the dumping shaft, the working can start. 7: After the 4 chain rings connect with the hopper’s lifting ear, the lifting working can start. 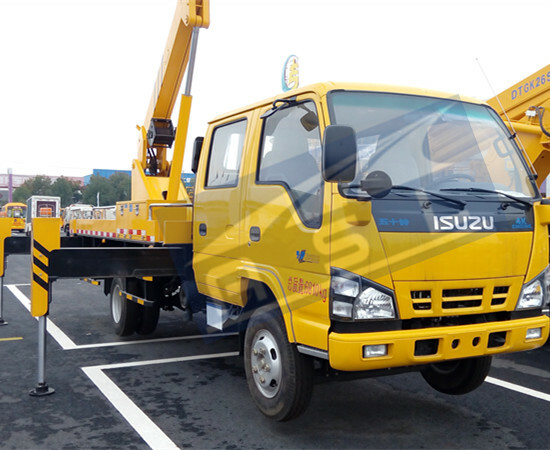 8: The adjustment bolt of the safety valve on Top ISUZU Skip Loader Trucks cannot screw unbinding.